With a steadily increasing number of samples to perform, diagnostic laboratories are challenged to meet this demand while maintaining high quality standards. Automating processes is an important step forward to achieve maximal efficiency. The ideal robotic system must be robust, precise, user-friendly and able to perform complex processes. The microproof® Diagnostic Interpreter allows fully automated results analysis for real-time PCR testing of food samples. The other three modules have been developed for automated clinical applications on the microproof® Robo+. 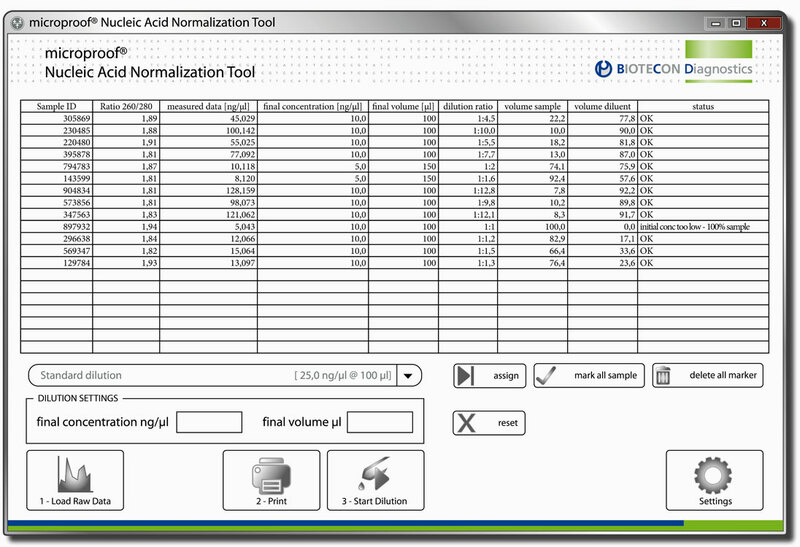 The microproof Nucleic Acid Normalization Tool allows fully automated dilution preparation. After importing the sample concentration values from a UV-photometer and entering the desired target concentration and volume, the dilution steps are calculated and executed by the pipetting robot.